It was supposed to be a relaxing vacation to California. Instead, Zoey and Claire take an unexpected detour when their private plane crash-lands into Arizona’s mysterious Superstition Mountains. 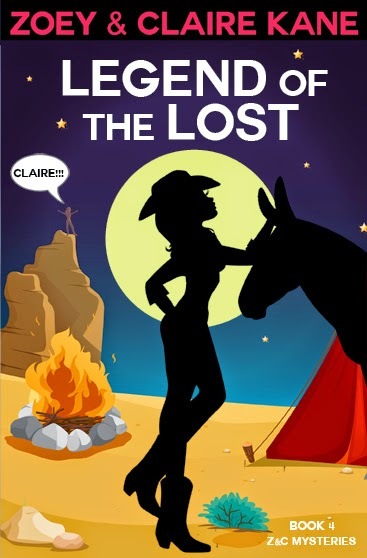 Taken in by a dude ranch where everyone and their grandma is obsessed with the fortune of The Lost Dutchman’s Mine, romance with handsome, ropin’ cowboys becomes a top priority. The last thing on their minds is murder. But as Daniel Walks-With-Secrets, heartthrob captain of the sheriff’s department, warns, “Greed is a recipe for bloody misfortune.” With a stubborn resilience that only a mother-daughter relationship can summon, the ladies are fixin’ to find the culprits… and the treasure. Pick up your copy at Amazon.com, HERE. Barnes and Noble will have it up shortly.